How does one go from a $50 investment of mom’s money to a $100 billion dollar shoe giant? Nike is one of the iconic international brands today. If you take a look at the top athletes across the world, most likely they wear Nike’s on their feet. To know that the brand started with humble roots would inspire just about anyone to do great things. 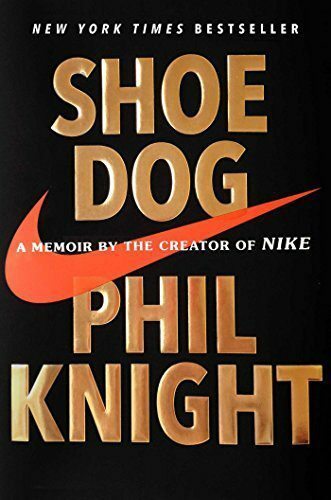 Shoe Dog: A Memoir By The Creator Of Nike by Phil Knight is a riveting, courageous and inspiring story of how one man – entrepreneur, athlete and father – took on all odds to see his Crazy Idea come to life. For Phil Knight, countless failures, setbacks and obstacles are worn like badges of honour. Every obstacle overcome just leaves the competition further back in the dust. Shoe Dog is an endlessly entertaining read that had me flipping through the pages like a madman to see what would happen next. Phil’s relentless determination is contagious. Any entrepreneur with a Crazy Idea should read this memoir. As a young adult, Phil spends months vagabonding across the world in different countries. These seemingly inconspicuous adventures had a profound impact on shaping Phil’s perspectives and destiny as a leader. By being around those in varying cultures, customs, status, cuisines, architecture, languages, dress, mannerisms, etc one is able to truly grasp what the human condition means. His experiences even inspires me to consider long-term travel. On a whim, Knight schedules an interview with a Japanese running shoe manufacturer and presents himself as the representative of an American distributor interested in selling Tiger shoes to American runners. The executives like what they hear and Mr. Knight places his first shoe order soon thereafter. What really mattered in this situation, is the grandiose vision he shared. Business is a lot like sports. Because managing cash flow and growth is extremely delicate, the company (originally called Blue Ribbon) would constantly run out of money yet manage to find a way through the situation. An important lesson is to always have a backup when funding your idea and also sourcing your product. Besides, there is too much capital available for savvy entrepreneurs with great ideas. When a bank rejected Nike on the basis of accounting, Japanese investment firm Nissho saw the vision and invested even more into his Crazy Idea. This is a Hero’s journey every step of the way. Phil leads a misfit gang of outcasts and together they build a brand that is unlike any other. People don’t just buy Nike shoes, they buy what it feels like to be an athlete. Nike is about artistry in motion. There is an element of freedom when competing – individual or team – that bonds the human spirit together. This, is the essence of Nike. Overall, the book is a great source of what not to do in business, which is probably even more important than knowing what to do. As the story unfolds, the importance of human relationships comes into play. This is not just the memoir of a singular person, but of the souls and persons, great adventures and struggles behind the brand. Form a team that has something to fight for and they will perform their best. Achieving success takes cooperation and a little bit of luck, but mostly never giving up and taking on failures head on. An entrepreneur’s vision supersedes all the naysayers who say they can’t do it, and their team is there to back them up. The last important lesson Phil shares is that of time and making sure to live your life the way you want, how you want. At the end of a life lived, you will look back at your memories. Make sure they were well spent with the people you love and doing the things you really wanted to do. This is the secret to living an amazing life. Just do it. An epic tale of courage and faith. 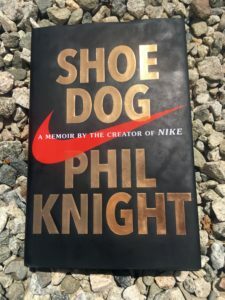 As an athlete and entrepreneur, it is easy to relate to both the relentless pursuit of Phil Knight’s belief in his Crazy Idea and also the failures that come with doing whatever it takes to see your dream become a reality.